I’m back to update my Korea Trip, Day 4 in Jeju! In our 3D2N Jeju trip, we have hired a private taxi on our 2nd day. If you have 2-4 person travelling with you in Jeju, it will be more economical hiring a private taxi. You can plan the routes yourself and the places you wanna go, discuss with the driver and he will bring you to those places during the tour. Make sure you search for a driver before your Jeju trip and book him in advance, the driver I booked was Mr David. He’s an English speaking driver, very nice always offered to help us take pictures. And share with us a lot of stories and knowledge about Korea during our visit to Jeju Folk Village. Their rates was around 130,000won for 9 hours. Please also make sure you plan your route beforehand, West of Jeju will be 1 day and East of Jeju will be another day. You can’t combine East & West of Jeju in 1 day due to the distance. So our second day we planned for East of Jeju. Mr David told us East Jeju have more outdoor attractions and West Jeju is more of indoor attractions like Museum. So if you love to see beautiful sceneries, East Jeju will be the choice. Mr David picked us up at our Hotel at 9am and started our tour! Only 1km of the 13,422m Manjanggul Cave is open to the tourists, Mr David told us that to finish the 1km, we may need around 1/2 hour. But we only spent around 10 minutes inside the cave and we don’t intend to walk further. Inside was quite dark we couldn’t really take pictures and the ground was so uneven we need to be extra careful so we decided to turn back after 10 minutes. After Manjanggul Cave we went to this beautiful place called Sangumburi Crater. Sangumburi Crater is my favourite place of all in Jeju, totally mesmerized by the beautiful scenery. I did a research beforehand and got to know from Forum Sangumburi Crater is a must-visit during Fall season. After taking tons of pictures at Sangumburi Crater we moved on to The Trick Art Museum. Besides indoor area, there’s also a mini outdoor safari for us to take pictures with the real size animals. Trick Art Museum was a bit disappointing, indoor is quite small, you can actually finish the whole museum less than an hour. The fun part was taking pictures with various fun poses blending nicely with exhibitions. After 3 attractions, its time for lunch! Mr David brought us to a restaurant near Sunrise Peak area. 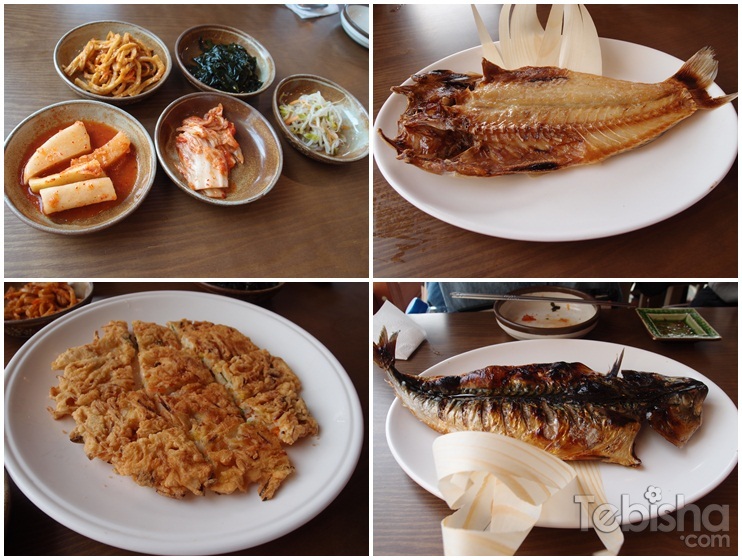 Yummy Mackerel fish and Seafood Pancake! After lunch, Mr David drove us to somewhere nearby to enjoy the awesome scenery of Sunrise peak. We didn’t climb up the peak due to insufficient of time and energy, if you love to hike you may climb up to the peak and enjoy the awesome scenery. Traditional huts and cultures! You may also try out Korean Traditional Hanbok and experience Korea style of wedding ceremony at the Folk Village. Enjoy the lovely waterfalls and sea breeze.. Don’t have to spend much time there cause its quite crowded..
Must be careful of the rocks, you may need to climb up and down to find a nice spot for pictures with the waterfalls. In 9 hours of tour, we went to 6 places in the East of Jeju. Great experience, great company and fabulous yummy lunch! you may look for my friendly driver Mr David Kim. We went back to Seoul the next day for my hair makeover at Juno Hair. Hi Yan Teng, im planning a trip to Seoul this April. Am keen on trying out Tria hotel, do u find it accessible and convenient to locations like dongdaenum, sincheon and myeondong? thanks! Hi, Tria Hotel is located in Gangnam.. It's much nearer to sincheon than myeongdong & dongdaemun.. Tria is located quite near to yeoksam train station around 5-8 mins walk.. 30-40 mins to myeongdong & dongdaemun for subway train rides. Just like to ask if we also need to pay for the expenses of the private driver we book? like his meals, admission fees to museums/attractions(if any), parking fees, etc etc? Driver will get free admission to some attractions and free meal in some restaurants too..
How do I go about booking a private taxi? Could you share the link to the website of the taxi company? You can email the Taxi Company: kimchj99@konet.net and if you wish to use the same driver as mine, in your email do request for Mr David Kim. All my friends emailed the Taxi Company for booking. Or you may give them a call Contact No: +82 102 4274 1230 Thanks. Hi i contacted the emial you gave, but i got the notification from gmail saying that the email was wrong. How should i contact him then? Oh no.. Maybe it was quite sometime back they have changed the email address..